The Sanskrit word Tantra means "web", an unbroken continuity, the connectioin between whoever and whatever exists. Tantra comprises various ideas and ritual practices characterized by the use of the ordinary and physical to access the non-ordinary and multidimensional, connecting the microcosm with the macrocosm. 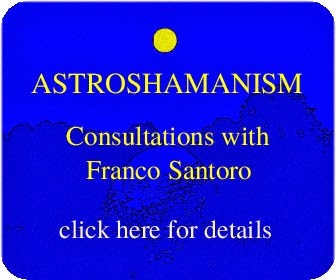 Astroshamanism and holistic awareness involve exactly the same. Tantra is an anagram of tarant and tartan. Tarant refers to Tarantism, a form of envenomation caused by the bite of a kind of wolf spider called tarantula, which engaged its victims in frenzied and ecstatic dances. A particular Southern Italian dance, called the tarantella, and its related music, was considered as the only cure for this condition. This was a strategic means of deceit aimed at evading the ban against trance dances and Bacchanalian rites, leading to an ecstatic connection with the web of life. This practice ritually opens up to the cathartic expression of the Sun and Moon polarities, with the aim of accessing the mysteries that exist beyond the realm of conflict and duality. Tarantella is a significant example of cultural and religious shape-shifting of traditions dating back to most ancient times. Similar dancing practices have managed to survive in most parts of the planet, mainly thanks to the capacity to hide their original motivation and compromise with incompatible local and contemporary belief-systems. Tarantella dances are used regularly in astroshamanic dance workshops, for promoting release from blocks and the healing of deep emotional wounds, as well as for unveiling hidden potentials by entering into expanded states of consciousness and grounding them in everyday reality. For further information see Karen Luedke's book, Dances with Spiders (Click here). The Tartan is a web pattern consisting of criss-crossed horizontal and vertical bands in various colours. The tartan is currently associated with Scotland, though it is common to many Indo-European cultures and its earliest evidence dates back to 400 BC. AstroshamanicHealing® Touch and Primal Embrace is an astroshamanic application of tantra, employing elements of tarant music and dance, with workshops taking place primarily in the country of the tartan. The Blessed Way of Passion from 16 to 23 April 2011 at the Findhorn Foundation (Scotland). The Sensuality of the Void: Assisi AstroshamanicHealing® Retreat in Assisi (Italy) from 15 to 20 July 2011. The Original Quest: An Astroshamanic Journey of Soul Retrieval into Space and Time from 18 to 25 June 2011 at the Findhorn Foundation (Scotland). Restoring the Fragmented Heart: Soul Retrieval and the Way of Sacred Relationships from 13 to 20 August 2011 at the Findhorn Foundation (Scotland). Findhorn Foundation Training in Astroshamanic Trance Dance from 15 to 28 October 2011 at the Findhorn Foundation (Scotland).